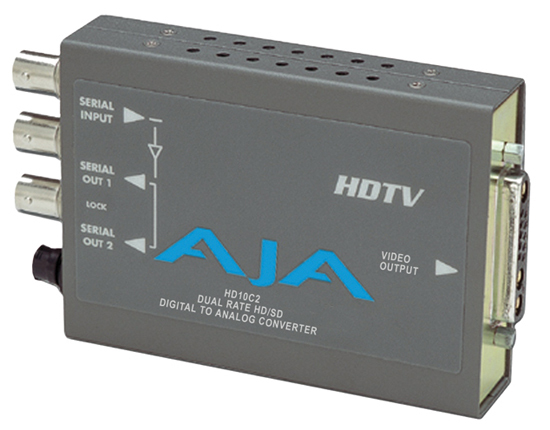 The HD10C2, AJA’s second generation HD D/A converter, brings exciting new features. In addition to being a high-quality 10-bit HD converter, the HD10C2 is “dual-rate” and works with both HD-SDI and SDI inputs. For HD-SDI inputs, the HD10C2 outputs full bandwidth HD component or VGA-style RGBHV video. For SDI inputs, component or composite SD outputs are supported. When connected to a multi-format monitor like the Sony 20L5, the HD10C2 will automatically provide an image from almost any HD or SD input format. The HD10C2 also features 2 equalized HD-SDI outputs.